Embarking upon a final U.S. tour as a four piece in the spring of 1968, The Yardbirds wholly abandoned the pop-oriented leanings/impositions of the Mickie Most era. Resolving to make the best of its last months together, the group rallied to deliver its most compelling and “progressive” live performances yet, in the process dropping somewhat lighter fare like Garnet Mimms’ “My Baby” and Bob Dylan’s “Most Likely You Go Your Way and I’ll Go Mine” that had made it through 1967. Even among contemporaries like Cream, the Jimi Hendrix Experience, Vanilla Fudge, and the nascent Jeff Beck Group, the 1968 Yardbirds represented a startling dramatic and improvisatory force. Though insufficiently documented on the infamous Live Yardbirds: Featuring Jimmy Page release (re-released as Yardbirds ’68) as rather sparse if engaging affairs, the concerts had, by the last third of the tour, developed into stirring exercises in blues-laden psychedelia that culminated with a pair of dates at USC’s Shrine Auditorium on May 31 and June 1. Fortunately preserved in distant but clear quality on the 1979 triple-LP release Last Rave Up in L.A., these shows mark the fullest fruition of Jimmy Page’s efforts with The Yardbirds and infuse the most successful elements from his work during the 1960s. Liberal use of effects and distortion, suite-like instrumental progressions, bowing, and heavy improvisation–all without the aid of a rhythm guitarist–typify Page’s playing throughout the tour, but his instrumental command proves undeniable upon hearing the Shrine tapes. That such landmark recordings as “Shapes of Things”, “Over Under Sideways Down” and even “Happenings Ten Years Time Ago” should seem of secondary interest beside the ever-expanding “I’m A Man” , “Smokestack Lightning”, and “Dazed and Confused” exemplifies the extent to which the group had shifted from the popular successes and three-minute formats of previous years in favor of pushing their collective and individual talents on a nightly basis. Jim McCarty and Keith Relf, whose apprehensions and fondness for lighter pursuits in the vein of The Turtles and Simon and Garfunkel would herald the band’s dissolution, sound inspired during the tour and arguably contributed the finest performances of their caree rs during this tour. Relf, despite the absence of a lung, pushes himself instrumentally and vocally, ad-libbing lyrics during the longer tracks and almost composing whole verses. More than ever his harp playing complements Page’s drones, sirens, and hysterics. Chris Dreja, comfortable in his adopted role as bassist, also inserts himself a bit more confidently, working with rather than behind McCarty and Page. It is a testament to the group’s balance and acuity that at no point do the 8+ minute renditions of “Dazed and Confused”, “Smokestack Lightning”, “I’m A Man”, “I Ain’t Done Wrong”, and “I Wish You Would” devolve into the languid jams that often befell the San Francisco groups or shed the notion of collaboration altogether as certain lengthy Cream numbers were wont to do. While certainly not conservative, these looser excursions openly follow Page’s lead and, as a result, retain a focus that an all-out jam likely would not. Even then, the performances do not consist merely of Page running up and down the fretboard or drowning out the rest of the band with ten-minute feedback solos. Each track develops with some kind of resolution in mind, and all four musicians contribute to creating fluid and gripping instrumental passages. This approach also allowed the band to work in material such as The Velvet Underground’s “I’m Waiting for the Man” and Donovan’s “Hey Gyp” (on “Smokestack Lightning” and “I Wish You Would”, respectively) that showed both an appreciation for the broader rock scene and quite a bit of comfort in their on-stage abilities. Page’s lead work, meanwhile, is at its finest and most varied through this point in his career, as displayed in the rending “Mr. You’re a Better Man Than I” breaks, the increasingly-ambitious “White Summer”, each of the epics, and his execution of the shorter, tighter tracks. Though the end was to come less than two weeks later, the Shrine tapes offer nothing that would suggest a musically spent or bored force. Doubts as to Page’s influence or relevance during his time with the group, supposedly corroborated by the group’s lack of chart success and the Most-approved horrors, do not come off quite as well. The disparity between the band’s live act and its studio output was no more apparent than during the 1968 U.S. Tour. While the CBS Studios tracks cut in April displayed, if only briefly, The Yardbirds’ daring and range as a four-piece, the material released between March of 1967 and March of 1968 had done little to prepare audiences for the torrential effect of a typical Yardbirds performance. This, of course, had long been an issue for the band, as even the Clapton and Beck incarnations had suffered from softened studio production and/or limited resources and recording time. However, the quartet that managed to record “Think About It”, “Glimpses”, and “Avron Knows” direly needed the opportunity to produce a fully-realized album, which Little Games, despite its numerous redeeming qualities, in no way constituted. As Keith Relf regularly attested, the only legitimate representation of The Yardbirds’ sound was its stage work, and the 1967 and ’68 tapes stridently back up this claim. It is worth noting that by this juncture Page had already exceeded his peers in the realm of stylistic diversity, employing sitar-influenced runs during the DADGAD-tuned, acoustic “White Summer”, open G-tuned slide during “Drinking Muddy Water”, bright 12-string rhythm work during “Most Likely You Go Your Way and I’ll Go Mine”, acoustic/electric layering on “Puzzles”, and stark blues soloing during “Smile On Me” and the live “New York City Blues” that presaged his more accomplished outings with Led Zeppelin. Most glaring are the advances in heavy rock and the discordant, studio-oriented sounds found on “Happenings Ten Years Time Ago” (Page’s first composition for The Yardbirds), “Think About It“, and the legitimately avant-garde Little Games centerpiece “Glimpses”. The last of these notably incorporated audio recorded on the Staten Island Ferry and signaled (along with “Tinker Tailor Soldier Sailor”) Page’s initial application of the bowing technique in the studio. Live, the number would emerge as a unique display as the band projected film clips and played Page’s tape of sound effects in the background. It would be replaced, in effect, with “Dazed and Confused” for the 1968 sets. Technologically, Page had persisted in his ventures with fuzz (which he, supplied by Roger Mayer, had refined and popularized during his session days) and adopted the Vox wah-wah pedal upon its release in early 1967, employing the effect on “Glimpses” and “Smile On Me” during the April 29-May 1 Little Games sessions; this roughly coincides with Clapton’s recording with wah-wah for “Tales of Brave Ulysses” and predates Hendrix’s use of the effect on the “Burning of the Midnight Lamp” sessions by two months. Page subsequently became one of the pedal’s foremost exponents, applying wah for “color” and (especially on rhythm parts) depth and introducing the effect immediately to the live repertoire (most dramatically on “I’m A Man” and “Mr. You’re a Better Man Than I“). The most obvious measure of Page’s success in this regard, however, is that the group’s overall sound never suffers from the absence of a rhythm guitarist. In fact, Page manages to fill the gap so convincingly that it becomes difficult to imagine that The Yardbirds ever felt the need to employ two guitarists at the same time. Never quite as heavy in the use of feedback as his contemporaries, Page has to make the most of his moments on songs that call for fewer effects and cover the lead and rhythm parts for every song recorded before he unofficially took over in August 1966. Songs in which the separation between lead and rhythm is most noticeable, such as “Heart Full of Soul”, “Shapes of Things”, and “Happenings Ten Years Time Ago”, do not exactly lose depth or drama when Page is playing, and if anything The Yardbirds only sound richer and fuller in sound in 1967 and ’68. March 30, 1968 in New York: the professionally-recorded, infamously-withdrawn Live Yardbirds: Featuring Jimmy Page. Yardbirds ’68 includes the entire concert remastered without crowd overdubs and certainly improves the show’s standing. As Page put it, however, “The thing about the Anderson Theatre show is that it really is a boiled down version of the longer set that [The Yardbirds] would’ve played at venues that were perhaps a little bit more underground, like the Grande Ballroom in Detroit or The Fillmore in San Francisco. There were more numbers that we had in the set at the time”. The Fillmore and Shrine tapes prove this to be a gross understatement. 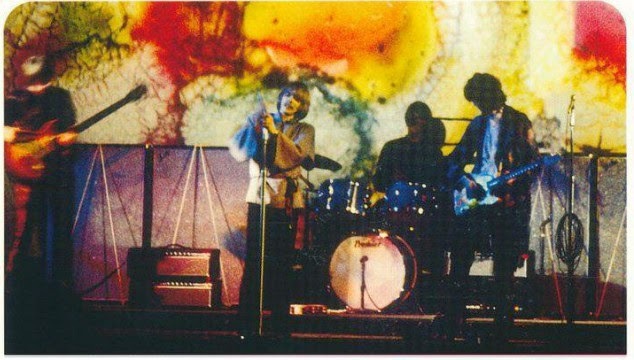 May 23, 24, or 25, 1968 in San Francisco, CA: flawed but fuller in sound than the Shrine recording, the tape preserves a show that is almost identical to the L.A. dates in style. Similarly improvisational and heavy, the performance falls just short of the spectacles at the Shrine but is certainly accomplished in its own right. May 31 and June 1, 1968 in Los Angeles, CA: the Shrine Auditorium tapes provide the most representative live recording of The Yardbirds during Page’s tenure. The Yardbirds in action, 1968. My future wife and I were also in the audience that evening and have been searching for missing info. from that show. Approximately when it was and confirmation if it was the last show for Jimmy Page.